The Harry Hampton Memorial Wildlife Fund Inc. announced the winners of its annual scholarship program on Friday, September 23 at their fall board meeting in Columbia. The Hampton Fund annually awards scholarships to South Carolina students who attend an institution of higher learning within the state. The Fund’s top scholarship, $5,000 a year for four years, was won by Logan Bodiford of Walhalla, a graduate of Walhalla High School. Mr. Bodiford, who is attending Clemson University, competed with nearly 100 students from across the Palmetto State for the organization’s top scholarship. 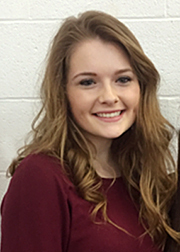 Cayla Campbell of Sharon, a graduate of York High School, is the recipient of the S.C. Department of Natural Resources Robert M. Gifford four-year scholarship valued at $2,000 per year. Ms. Campbell is attending Clemson University. The Gifford Scholarship is limited to legal dependents of any full-time employee or retiree of the SCDNR. Ms. Campbell’s father, Todd Campbell, is a retired SCDNR Wildlife Conservation Officer. Boston Chase Henderson, of Lake Wylie/Clover and a graduate of Clover High, won the James O. Thomason scholarship, valued at $2,000 a year for four years. Mr. Henderson is attending the University of South Carolina. The Hampton Fund's $2,000 one-year David M. Cline Scholarship for law enforcement/criminal justice was awarded to Kelli Smith of Murrells Inlet, a graduate of St. James High School. Ms. Smith is attending Coker College. Michael Adam Larkin, also of Murrells Inlet and a graduate of St. James High, was awarded the Wallace F. Pate Scholarship, worth $2,500 for one year. Mr. Larkin is attending Clemson University. "To date, the Hampton Fund has awarded almost $400,000 dollars to deserving students," said Hampton Fund Executive Director Jim Goller of Beaufort. "I'm particularly excited that the Hampton Fund Board recently voted to increase the funding of several scholarships for 2016-2017 to help our winners offset the high cost of tuition." The Fund's Hampton and Pate Scholarships require that the student major in a natural resources field. The Pate Scholarship is named for the late Wallace F. Pate, a pioneer of offshore fishing in the Palmetto State and is given in conjunction with the S.C. Governor’s Cup Billfishing Series. The James O. Thomason scholarship, named for the late James O. Thomason, a past Hampton Fund board chairman, is awarded to a student studying print, electronic or photo journalism. It is one of only a few scholarships in the nation available to journalism majors. The Cline Scholarship, named for the late David M. Cline, a founding board member of the Hampton Fund who also served on the board of the Governor’s Cup Billfishing Series and on the SCDNR Law Enforcement Advisory Committee, is open to students majoring in law enforcement/criminal justice/forensics. The Robert M. Gifford Scholarship is limited to legal dependents of any full-time employee of the SCDNR and is named for the late R.M. “Bobby” Gifford, long-term Chief of SCDNR’s Law Enforcement Division. Scholarship applications for 2017-2018 must be received no later than January 31st, 2017. To receive a scholarship application or for more information on the activities and organization of the Hampton Wildlife Fund, write to HWF, P.O. Box 2641, Columbia, S.C. 29202 or visit www.hamptonwildlifefund.org. Scholarship applications and criteria are available for download on the scholarship page. The Harry Hampton Memorial Wildlife Fund, Inc, established in 1981, is a private, non-profit corporation which partners with the S.C. Department of Natural Resources and other organizations for the promotion of education, research and management to benefit conservation of wildlife, marine and other natural resources in South Carolina. Funds are obtained solely through private donations and special promotional projects, events and publications. Contributions are administered by a board of directors, chaired by Dr. Julius Leary of Greenwood, comprised of fourteen South Carolinians committed to responsible natural resources management and education. The total donated to the SCDNR by the Hampton Fund over the years now totals $3,332,555.